Apple just opened a new grand new chapter in its book with the iPhone 7. Apart from the numerous hardware and feature improvements (waterproof body, anyone? 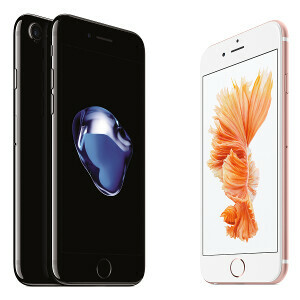 ), the new iPhone 7 brings forth two new color options and doubles the amount of storage previously available on Apple's phones. Great! But how does the new iPhone flagship stack up against the iPhone 6s and the iPhone 6, which is already getting a bit long in the tooth. True, Apple highlighted a couple of noteworthy differences between the current and previous generations of the device, but it won't be us if we don't provide you with a complete specs sheet comparison between the trio. Best SoC, Best camera, Best display, Best battery life, Best ecosystem for both app and accessories make iphone the best phone out there. Especially this year iPhone 7 plus is awesome. Apple this new tech in an iPhone 7. Yet Apple still has to go with a low resolution display in the iPhone 7. Apple is the only one to sell a flagship device at a flagship price with such a low resolution display. what do you mean its retina? isnt that the best ? bazels are good as well :d ok no BS, phone looks dope, i like it a lot, but to pay premium for that size and get 4.7 and low res screen, no no no, and battery on 4.7 iphones are we all know half day mostly. then again my edge 7 is 5.5, same as iphone 6/7 plus but iphone feels like snow shovel, its so much bigger and packs just 1080 screen LCD which is old as F, plus battery in real life tests it is behind edge 7. so once again no hard feelings, i was expecting something more for that $$$. by the way i used to have 5s iphone and still have macbook pro, please dont tell that ios has 10000000apps, i know almost all of them are useless. ecosystem, well, last time i tryed to sync my songs rating from ipod to mac, i lost all playlists and ratings on ipod, so lets be real. good luck for ones who will sleep few days next to apple store doors. So they wanna sell this for 2 years because the phone is faster? You talk about functionality, yet Apple still has the lowest resolution flagship at a flagship price. There is no excuse especially when Apple is boasting and bragging on how fast their A10 chip is. So why doesn't Apple put a 1080p display on their 4.7" iPhone? It's not like a 4.7" display hasn't has a 1080p display in the past. We know why, so Apple can boast and brag about the specs and speed, once again. The only idiot is you kiko007. i gave simple example to this, to my apple friend. i run 1440p screen on my pc, i can put 1080p screen most games will run 150-200 fps, which is amazing, but 1440p i have around 100 fps, sure ifans will not understand that. i personally enjoy more pixels + amoled than extra uber fast sh%^& low res screen, since its just a phone not a rendering machine.